Before you read any further, let’s clear the air: constant, proactive engagement with the LSAT is the golden standard for increasing your score. That said, there is an important thing you need to keep in mind: maximizing your LSAT score sometimes requires taking a break. Or two. While this may sound simple (or indulgent), it is neither. Trust us—as a future law student, indolence is the last thing you will ever be accused of. Start reading the right newspapers and magazines. Want to improve your causal reasoning skills? Almost every day there is an article in the Science or Health sections of the New York Times discussing some study involving correlations. Read these sections daily. The Economist is even better. Its Science and Technology section contains articles that we swear could have been picked from the Reading Comprehension section of the LSAT (or would it be the other way around?). The Economist has both the style and the content you will find incredibly useful if you want to prep for the LSAT without opening a test prep book. Just a cursory glance at this week’s edition reveals familiar topics: Roy Lichtenstein, financial innovation, innocuous viruses, the science of memory, and so on. Read it weekly. Physical exercise. Physical activity is known to improve learning, so make it a habit. You don’t need access to a fancy gym or the great outdoors, although there is absolutely nothing wrong with either. Even moderate-to-low intensity cardiovascular exercise, such as walking in the park or biking around the block, can have an immensely beneficial effect on your ability to learn and retain information. Don’t take our word for it: it’s a fact. Mental exercise. You think Logic Games are fun but get tedious sometimes? Try Sudoku. There are tons of Sudoku resources on the web, and it’s always a fun way to pass the time while still exercising your brain. Now, you can always pay to harness your brain’s neuroplasticity, but really? You may be better off making an Advanced Linear Game out of your daily schedule. All things considered, the rigorous cycle of lessons and homework, practice tests and test reviews, tutoring sessions and lesson recaps is the only thing that has been proven to actually increase your score. But learning how to take a break from this cycle is also crucial. Indeed, a “study break” need not be a break from the conceptual framework that underlies the LSAT: sometimes, a break can help you understand and apply that framework to a variety of seemingly disparate contexts. 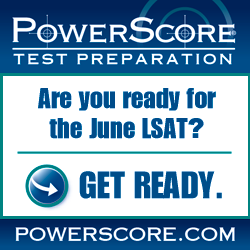 Yes, the LSAT is everywhere. Have fun with it!